SUVA, Fiji - The guided-missile destroyer USS Shoup (DDG 86) arrived in Suva, Oct. 3, as part of the ship’s Oceania Maritime Security Initiative (OMSI) deployment. While in Suva, the crew will host distinguished visitors, conduct professional exchanges with Fijian sailors, and participate in community events during their port visit. Shoup’s visit to Fiji marks the first stop in the ship’s OMSI deployment, which is a secretary of defense program aimed at diminishing transnational illegal activity on the high seas in the Pacific Island nations of Oceania's exclusive economic zones (EEZ) and enhancing regional security and interoperability with partner nations. Through bilateral agreements, the U.S. Coast Guard assists ten Pacific Island nations in patrolling the waters around their EEZs. Each of the nations have territorial waters stretching out 12 miles from shore. Beyond that, stretching out 200 nautical miles are EEZs, an area defined by national law that allows each nation exclusive rights to the exploration and use of maritime resources. 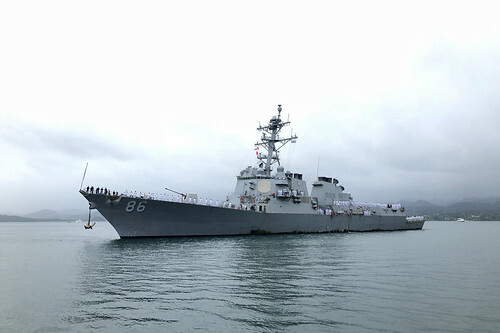 U.S. 3rd Fleet leads naval forces in the Pacific and provides the realistic, relevant training necessary for an effective global Navy and constantly coordinates with U.S. 7th Fleet to plan and execute missions that promote ongoing peace, security, and stability throughout the Pacific theater of operations.